It was raining and a little windy when we left the dock this morning. We had heard from reliable sources that on Sunday there was a lot of bait and fish in 150 feet of water a few miles southwest of Ludington. So we headed that direction to see if they were still there. We slowed down and checked it out and marked no bait a only a couple fish. We decided to go further south to where we had fished our last few trips. We set up in 160 feet of water and trolled southwest. The down temp was 46 degrees at 60 feet. We weren’t marking any big schools of bait, but we were seeing small pods every so often. The rain and wind both picked up when we were setting lines. We got them all set before we took our first fish. It was a small King the took a Super Slim Modified Blue Dolphin free sliding above a mag Fuzzy Bear Modified Blue Dolphin 45 down on an out down. We hit another King on a Yeck Wart Frog 55 down on an out down. One of our charter group was suffering from motion sickness and another one wasn’t feeling too good either. We turned back east looking for the bigger pods bait we had seen out there our couple times out. We found some along the 35 west line. We hit three more fish and boated two of them before our group called it quits and decided to cut the trip short and head back to shore. Our three hits were a 7.5 color core with a Super Slim Green Skinny Jeans, a 10 color with a glow Bloody Nose, both Steelhead, and a 250 copper with a mag glow spoon took a Laker. Good fishing today southwest of Ludington between 170 and 260 feet of water. Most of our fish came off boards and divers. We had bites on our 10 color cores with a Super Slim Whomper Stomper and a regular size Dreamweaver EVM spoon. One 5 color core bite on a Super Slim Magic Man and a 7.5 color core took one on a Yeck Whomper Stomper. We took a Steelhead on a 200 copper with a regular DW Green Skinny Jeans. We had good action on our divers. A high Slide Diver out 135 with a SS Steelie Stomper took one of our bigger Steelhead and our second largest King. 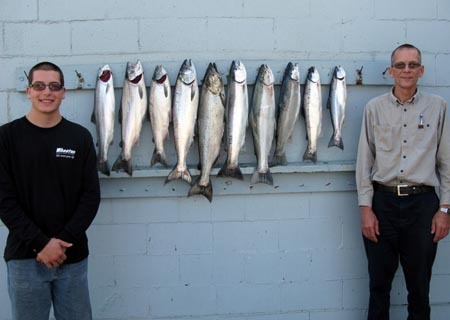 We took a fat Coho on a low wire diver out 70 with a magnum Fuzzy Bear Hot Rod and our biggest King came on a high wire out 150 with a mag Fuzzy Bear Raspberry Carbon. We hit 2 fish on a low wire out 85 with a Dreamweaver LD Fireball. Only three rigger bites. We took a Coho on a Super Slim Monkey Shine free sliding above a mag Fuzzy Bear Monkey Shine set a 50 feet on a out down and we missed one each on our chute rigger and other out down. Our best trolls were southwest and northeast. We are enjoying this great weather. It is a welcome change from last September. If you would like to give fall fishing a try call us at 321 425-8723 and set up a date .